This Chess set is called color chess set. In the picture above, you can see about its different color with ordinary chess set that commonly use in champion or in any chess game event. The ordinary chess set is brown and black, supported with its chess board. But to increase the interesting feeling of chess in your day, we try to make some different chess pieces. The red and dark green chess set will attract you to play outdoor with your friend or family. Just try it now! Those chess pieces are made from best quality Teak wood and carved by expert craftsman in beautiful shapes of chess. Sized in 26 inch and has polished well in a set of dark green and a set of red, make those chess pieces looks colorful. Bring a new nuance in your chess game. Supported with the chess board that suit for the size. 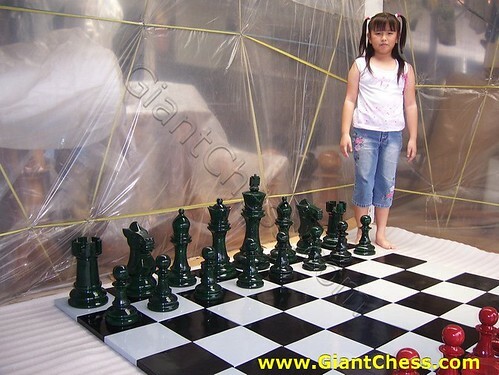 This chess set and board are perfect for outdoor game.